A look back at the highlights and memorable moments of the 2013 racing season. As we draw to the end of 2013, it’s great to look back over the significant events of year, which was action packed in terms of outstanding performances and achievements, events and stories. For the Museum, it was a landmark year in terms of progression towards the new National Heritage Centre for Horseracing and Sporting Art development. 2013 was also a poignant year, as racing said goodbye to one of its most popular characters. Although far from a highlight, the sad death of Sir Henry Cecil was undoubtedly one of the most significant events for the sport, as racing professionals and fans were united in mourning one of the greatest and most iconic British trainers, and a universally loved and respected gentleman. Similarly, the revealment of steroid use by trainers Mahmood al Zarooni and Gerard Butler dominated the Flat season, although the swift and harsh punishments enacted by the British Horseracing Authority BHA indicated the sport’s commitment to cleanness and transparency. Away from such tragedies and scandals, the athletes, both horse and human, lit up the year with some remarkable feats. 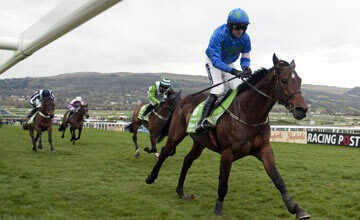 Hurricane Fly had a particularly memorable year, as he not only became the first horse since Comedy of Errors in 1975 to regain the Champion Hurdle, he also broke the record for Group/Grade 1 wins to take his overall tally to eighteen top flight successes. His stablemate Quevega made her own piece of history by winning a fifth Mares Hurdle at the Cheltenham Festival, matching the record held by five time Cheltenham Gold Cup winner Golden Miller. Over fences, Sprinter Sacre simply dominated the two mile chase scene, and added to his already lofty reputation with a scintillating win in the Queen Mother Champion Chase, before adding Grade 1 wins at both the Aintree and Punchestown Festivals (the first since Istabraq to do so). Fingers crossed that he returns in fine form in the New Year. For Roz, the Museum Marketing and Audience Development Officer, the highlight of the season was the “Grand National and the fact that is was so successful following the safety measures taken.” She also greatly enjoyed the successes of Sprinter Sacre and the Nicky Henderson team, and cannot wait for the 2014 Cheltenham Festival. The Flat season provided its own memorable moments, including Dawn Approach’s rousing win in the 2000 Guineas that lifted Godolphin from the shadows of the steroids scandal, to Estimate providing the Queen with a wildly popular victory in the Gold Cup at Royal Ascot. On a similar note, the filly Riposte provided Warren Place and Lady Jane Cecil with an extremely poignant win in the Ribblesdale Stakes, just a week after the death of Sir Henry Cecil. Making up for his loss was Farhh’s recovery from numerous (more minor) injuries to book-end an interrupted season with an impressive win in the Lockinge, and a hard fought triumph in the Champion Stakes, his final race before stud. The continuing success of German horses was emphasised by Novellist’s romp in the King George VI & Queen Elizabeth Stakes, although he was sadly denied a crack at the Arc due to illness. His absence was more than made up for by the wonderful Treve, who capped her unbeaten season with a demolition of Japanese superstar Orfevre. She is definitely one to look forward to in 2014. The arrival of Frankel’s first crop of foals in early 2014 is undoubtedly one thing, among many, to look forward to in the New Year. By Alice Kay, with the kind assistance of Museum friend, Tony Lake.